In the last ten years Electro-Magnetic locks (MAGLOCKS) is being used more and more, and although there is definitely a use for them in the market place, they have their limitations too, and in some instances should not be used at all. Maglocks are easy and economically installed with a ZL or L bracket on most aluminum or wooden doors, as well as steel gates. There is no need to cut into the aluminum where under normal circumstances specialized tools and a fair amount of skill is needed to fit a electrical mechanical lock – which most fitters do not have so they fit a maglock regardless if it is right for the application or not. Basic rule of thumb is not to fit a maglock where the cabling is exposed. There are several differences between a maglock and a electric lock. However, one of the biggest differences is the fact that an electric lock works on a normally open electrical circuit, where the magnetic lock works on a normally closed circuit. What this means is that there is no power to a electrical lock and only once the release button is pushed or the system is triggered in any another way, the circuitry is closed and the pulse of power to the electric lock allows the cylinoid to release the deadbolt and the lock kicks open. Therefore, if there is a power failure the lock stays closed and can only be opened manually with a key. 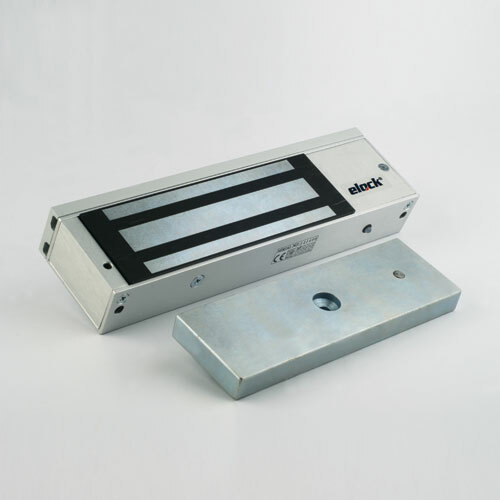 A maglock must have power on it all the time to stay closed and as soon as there is a power failure, it will automatically open. In the same way if the cable to the maglock is not hidden out of sight, it can be cut and the gate/door will open. If the power to an electric lock is cut, the door/gate remains closed. This is one of the biggest disadvantages of a magnetic lock.